SCHOOLBOY CRICKETER OF THE YEAR 1956... St. Anthony’s Katugastota cricketer W. Premaratne was the Schoolboy Cricketer of the Year 1956 when the contest was then organised by the Ceylon Daily News and sponsored by Hemachandra Brothers. Schoolboy Cricketer of the Year 1964.... Anura Tennekoon - that fine batsman from S. Thomas’ College, Mount Lavinia who headed the batting averages in the Schools and led the the Ceylon Schools team to victory “Test” against the Indian Schools was and for his fine showing selected the “Ceylon Daily News Schoolboy Cricketer of the Year 1964 by the Special Panel of judges nominated by the Cricket Umpires Association of Ceylon. SCHOOLBOY CRICKETER OF THE YEAR 1957 ...Ronald J. Reid of S. Thomas' College, Mount Lavinia was the Schoolboy Cricketer of the Year 1957. The panel of umpires comprising Messrs Dodwell de Soysa (Chairman), Laddie Bakelman, Joe Saverimuttu and Emilion E.V. Ellias made the decision in this office. Schoolboy Cricketer of the Year 1974 and 1975... Nalanda's star All-rounder Anura Ranasinghe is not with the cricketing fraternity these days (he died a few years back), he earned his eternal rest after some great cricketing deeds. First of all, Anura Ranasinghe was picked by the umpires as Observer Schoolboy Cricketer of the Year for two years in-a-row when the contest was sponsored by P. G. Martins. The Observer Schoolboy Cricketer of the Year Contest, which has produced Sri Lanka's cricketing legends for the past 29 years, has gained national status. Sri Lanka Cricket has given its blessings to the 30th Observer-Mobitel Schoolboy Cricketer of the Year Contest which starts today with the voting for the Most Popular cricketer - All-Island and Outstation awards. There are some people who merely talk and not recognise the deeds of cricketers who need merit. One such cricketer who has suffered in the past is none other than Sri Lanka’s world beater - the champion off-spinner and ‘Doosra’ specialist Muttiah Muralitharan who ‘found his feet’ in the game at an early age at St. Anthony’s College, Katugastota. The name of Ranjan Madugalle - a top Sri Lanka cricketer and a cricketer who blossomed out from Royal College was the talk of the town in the latter part of the 19th century. He really made his presence felt in inter-school cricket and was picked as the Observer Schoolboy Cricketer of the Year in 1978 and 1979. 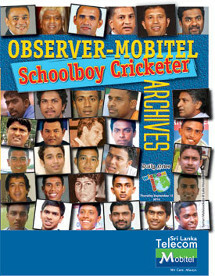 Look to the Sunday Observer for your cricket stars - you will be able to pick them quite easily. There is one cricketer who really stands out from the rest and he is none other than Arjuna Ranatunga who was Observer Schoolboy Cricketer of the Year in 1980 and 1982 and then climbed the ladder of success in inter-club and international cricket. 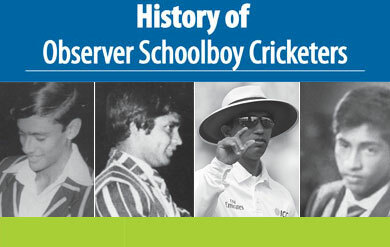 In cricketing circles in recent times, the name of Roshan Mahanama stands out like a beacon, both at inter-school level and even at the higher level among Test playing countries in the world.So, with such wonderful promise that he held out as a schoolboy at Nalanda College, it was no surprise that he would climb the ladder of success - and climb he did in inter-school cricket seasons and it was no surprise that the judges in the Observer Schoolboy Cricketer of the Year Contests, he was picked as Schoolboy Cricketer of the Year for two years in succession in 1983 and 1984. Thilan Thushara Samaraweera who became the tenth Anandian to represent Sri Lanka in Test cricket, was twice winner of the Observer Schoolboy Cricketer of the Year award in 1994 and 1995 and on both occasions, he also won the Best Batsman and Best All-rounder awards too.